The best first: I was a doctor for a while but then I quit. I simply didn’t have enough patience. Why did the singer take a bucket to her choir practice? She needed something to carry her tune. Have you heard there was a kidnapping at the school? But it’s fine now, the kid woke up again. I’ve never liked speed bumps much. But I’m getting over it slowly. What is invisible and smells of carrots? I saw an expiration day on an anti-aging cream. Now that’s just a scam! Why is our nose right in the middle of our face? Well, it is the scenter. How do you call a boat without a rope? How do you make holy water? Freeze it into ice, then drill in some holes. Jokes about communism are only good if everybody gets them. They say whiskey isn’t an answer. But I say it’s worth a shot. 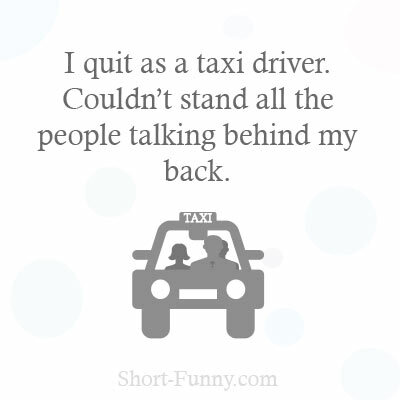 I quit as a taxi driver. Couldn’t stand all the people talking behind my back.